Sharon Solarz: The past 30 years in one sentence. Must be nice to see the world so clearly. For those who are perhaps not familiar with the Weather Underground, they were an American radical organization that employed violence against their own government in protest of the Vietnam War. 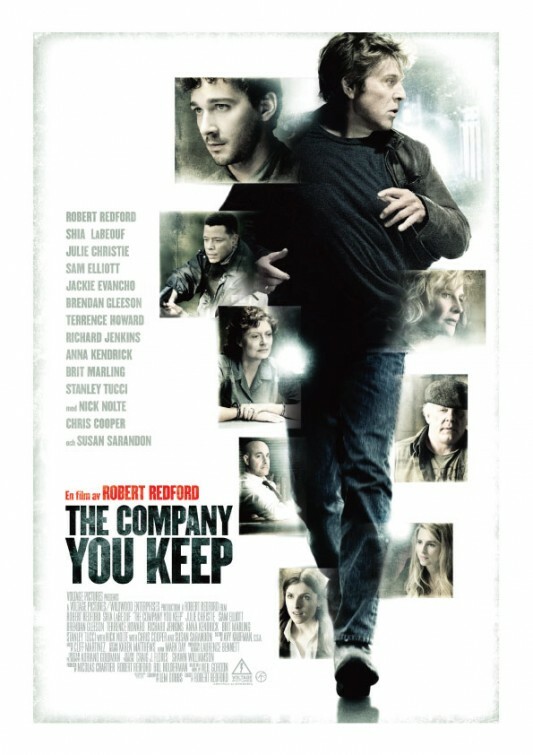 In Robert Redford’s latest film, THE COMPANY YOU KEEP, Redford imagines what it would be like for some members of the group to still be alive and hiding in America today. They were once ardent protesters, who were branded terrorists, and now, the few that remain, are soccer mom’s or local lawyers in small towns. Their lives have slowed and unfortunately, they brought the pace of the movie with them. At the onset of the film, a mother (Susan Sarandon) sends her kids off to school and sets out to turn herself in to the FBI for crimes she committed while she was a member of The Weathermen, as they were also known. This event triggers newfound interest in the case and the few others who remain hidden are suddenly being actively hunted again. The primary target is Jim Grant (Redford), a single father just trying to keep his daughter (Jackie Evancho) happy after the passing of her mother a year prior. He is uncovered by a local journalist (Shia LaBoeuf) and from that moment on, he runs. Subsequently, we follow and wait to find out if the man who has been running for 30 years can continue to do so successfully. What Redford is hoping for here is that we see all of the ideals that The Weathermen stood for also running and hiding in today’s contemporary setting. Instead, what we get is a thriller where an older, yet surprisingly spry gentlemen, runs as fast as he can, without realizing that it isn’t really that fast at all. Contrasting yesterday’s conviction with today’s lack thereof is nothing revelatory though, which leaves THE COMPANY YOU KEEP feeling a tad gummy when it’s meant to be biting. How many sheep would you give The Company You Keep?